Why is the UCI Bike Region Label good for Drenthe? The label helps to put Drenthe on the international map, especially among the many cycling enthusiasts in the world. It is also a label to be proud of as a province and inspires further development and confirms that the course chosen to put Drenthe on the map as a cycling province is correct. What is your contribution to cycling in Drenthe and what are your ambitions for Drenthe as a cycling province? The bicycle is an excellent means (sustainable and healthy) to travel through the province, whether that is because you have to go to work or school or to relax. Increasing bicycle use among our inhabitants is a challenge, though. With programmes such as ‘cycling to school’ and ‘cycling to work’, we try to make people aware of the convenience and possibilities of bicycle use and we encourage them to use the bicycle for their trips. In the context of my work at SportDrenthe, I am the project manager for this. Drenthe also has a couple of beautiful cycling events that need to be cherished. 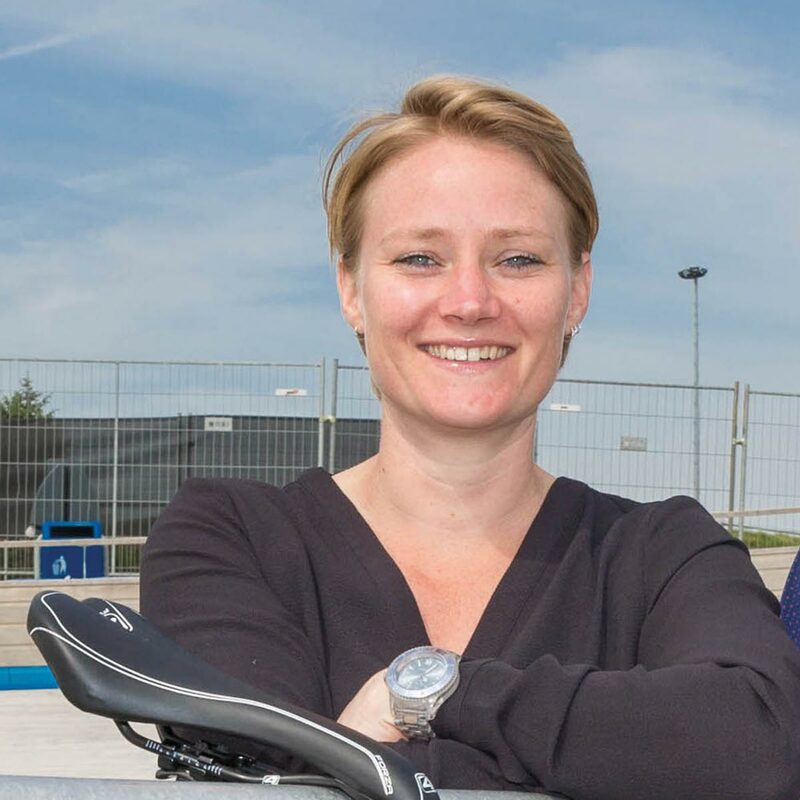 Ensuring that these cycling events have an impact, both economically and socially, learning from each other and strengthening each other, is my contribution from my role as project manager of the Events Knowledge Centre. The municipality of Noordenveld has the ambition to be a cycling municipality of the north of the Netherlands. This, of course, contributes to Drenthe’s ambitions. As the driving force behind this programme, I am trying to contribute to this. It is time that Drenthe, and not only Drenthe but also the North, showed its ambitions in terms of events. The World Championship Cycling 2023 is such an initiative: a great challenge for the region. Certainly to organise it in a way that the region also benefits from it. I’m proud to be a part of that! How does cycling contribute to innovation? Cycling is a theme that can be innovated on. Look at the VAM-berg for example, and the way in which a cycling experience is now being constructed where innovation and renewal are important starting points. If you want to stand out or lead the way, it is good to see how you can facilitate or implement innovation in the field of cycling. What are the highlights of the province of Drenthe for you? Drenthe has the largest sports and exercise accommodation you can wish for and the bike is an excellent way to enjoy it. There are beautiful landscapes to be enjoyed and Drenthe has an infrastructure that allows you to discover these landscapes. How can cycling improve tourism en visits in Drenthe? By creating a distinctive range and designing Drenthe in a bicycle-friendly manner. The bike is welcome in Drenthe! This means that there are interesting and challenging routes, such as the current development at the VAM-berg, the construction of new MTB trails and the connection of routes so that the cycling experience can be extended. And, accommodation and catering are arranged in such a way that bicycles, for many a very valuable asset, can be parked well, and the catering industry responds to the wishes of the cyclist. When you combine this smartly with the cycling events, you have very attractive packages for cycling enthusiasts who might extend their stay. How can the UCI Bike Region Label be used to get people on their bikes more often? The label can be used to show the surroundings that Drenthe is distinctive in the field of cycling. That Drenthe is at the forefront and has a lot to offer in the field of cycling. It can be an invitation to people to come and cycle in Drenthe or to choose the bicycle in Drenthe as a means of transport over the car, scooter, etc. We send a newsletter with information on the label and the showcases (In Dutch) four times a year. Sign up for the newsletter and don’t miss out on the developments and stay informed about the activities and events.